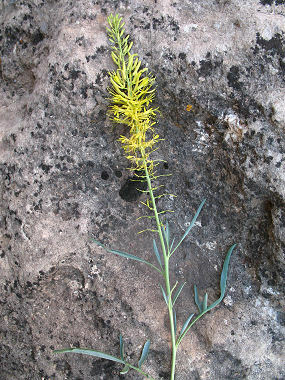 Desert Plume is a member of the Mustard Family. It grows to 6 feet in height and has grayish-green, narrow leaves which grow to 7 inches in length at the base of the plant, becoming shorter on the upper stem. The plant typically grows on mesas, dry plains and sagebrush areas at elevations between 2500 - 7000 feet. Native Americans used the seeds of the Desert Plume for mush. 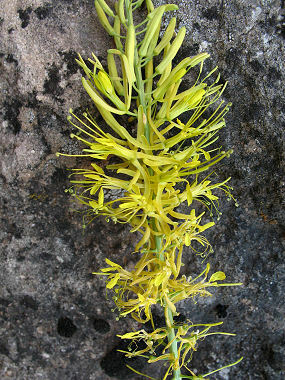 Desert Plume typically blooms between May - September and produces a terminal spike to 2 feet in length with yellow flowers with long stamens with 4 narrow petals to 1.25 inches in length each.